It is official, the young hot shots in Christie’s contemporary art department are marketing geniuses and in the art world is now operating in the post-truth era. 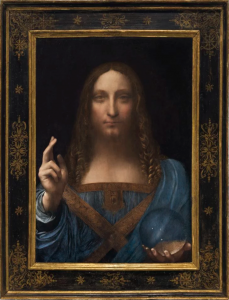 Leonardo’s Salvator Mundi just set a new world record for a painting costing its new owner an astonishing US$450,000,000. Post-truth follows post-idea, a theory popular in liberal circles in the US that big ideas are no longer sought after and have become elusive. Ideas seem smaller, not because we are dumber than our ancestors but because we have shorter concentration spans to concoct or understand them. Only big ideas that can be fairly quickly monetized are considered worthy of effort. Logical argument and debate have lost ground to superstition and faith. Think of the Renaissance relapsing back into the Middle Ages. Post-truth has filtered down from the top. No one believes what World Leaders say any more. People listen to them gently curious as to what might be behind what they are saying. An emotional response, based on instinct, has become more comfortable than a logical one. 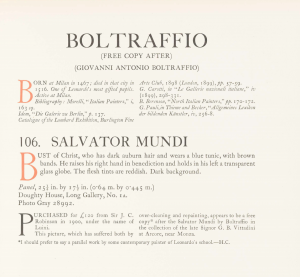 The sale of ‘Leonardo’s’ ‘Salvator Mundi’ for US$450,312,500m (incl. commission) is a triumph of marketing over truth. Christie’s focused their marketing on an idea so that whoever bought the picture is buying into the idea of Leonardo, an artist so highly revered as a Renaissance man that it is hard to look at his work subjectively without the baggage that comes with his reputation…scholar, scientist, inventor, writer and so on. Potential clients were shown a video of hundreds of people, including Leonardo di Caprio and Patti Smith traipsing past the painting, while bursting into tears and generally being overcome by what they saw. Of course these people were not really overcome by what was in front of them (a rather dopey and weird-looking Christ), but by the idea of Leonardo and how they felt they should respond. Jussi Pylkkanen, who took the sale, told those present that three kings, Charles 1st, Charles II and James II, had owned the painting. This statement may or may not be true but it was a perfect opening for the night and gave the painting the added lustre of a Royal provenance. 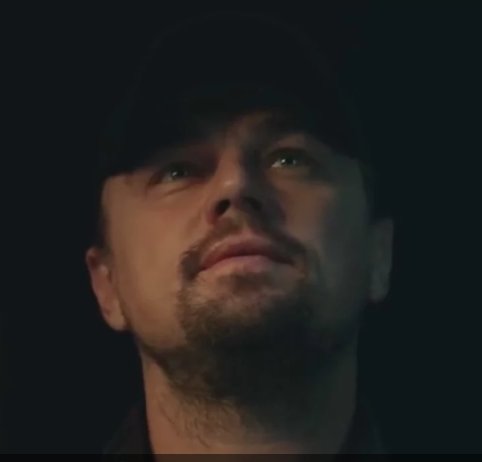 Leonardo di Caprio in the Christie’s video captured while contemplating the painting and perhaps his future role in the movie. 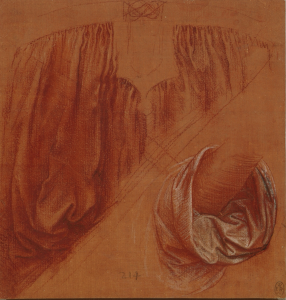 A study of drapery for a Salvator Mundi by Leonardo, c 1504, red chalk with pen and ink and white heightening on a plane red prepared paper, Collection of Queen Elizabeth II. 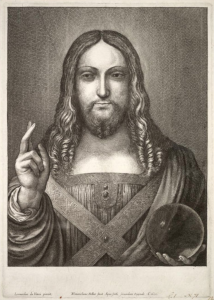 Christie’s follow this by saying, “What is known for certain is that it belonged to Charles I (1600-1649), the greatest picture collector of his age, and it is recorded in the inventory of the royal collection drawn up a year after his execution: “A piece of Christ done by Leonardo at 30:00:00” (£30).” Here Christie’s are just following the optimistic cataloguing of the dealers who owned the painting prior to its sale to Yves Bouvier. It seems odd that a hitherto unrecorded Leonardo was only mentioned for the first time in this inventory and was valued at pounds 30 when the other Leonardo in the collection, the ‘St John the Baptist,’ was valued at pounds 140. It may have been the Christie’s painting, that was just considered a school of Leonardo painting at the time, or it may have been a different version of this composition. The second possible preparatory drawing by Leonardo in the Queen’s Collection. Major paintings in Charles I’s collection are normally well documented. We find them in the inventories of the collections that Charles bought en bloc such as the collection of the Gonzaga dynasty in Mantua. Then we can follow them through the Commonwealth sales and their later history. 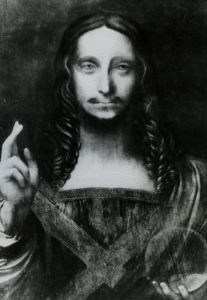 According to Jerry Broton, Charles only had one picture which was considered a proper Leonardo, ‘St John the Baptist.’ In Broton’s exhaustive study of ‘Charles 1st and His Art Collection, the Sale of the Late Kings Goods (Macmillan, 2006),’ he makes no mention of a ‘Salvator Mundi’ by Leonardo ever being in the King’s Collection. Charles had other Leonardo school works such as the painting attributed to Leonardo he was given by the Barberini family in 1635. He tried and failed to buy Leonardo’s work on other occasions such as in 1623 when Juan de Espinosa in Madrid declined to sell him the two books of Leonardo drawings now known as Codex Madrid I and II. As an example of the detail we know of the important paintings in Charles’s Collection Leonardo’s ‘St John the Baptist’ had been part of an exchange between Charles and the Duc de Liancourt where Liancourt received a Holbein of Erasmus, and a Titian Madonna, for the Leonardo. After Charles’s death it passed, in lieu of a debt, to the Keeper of the Cabinet Room, Jan Van Belcamp, who died shortly afterwards. His estate sold it a French merchant called Oudancour (for pounds 140) who was buying on behalf of the dealer, Everard Jabach, who in turn was selling to Cardinal Mazarin. The painting then returned to France and is now in the Louvre. Next piece of evidence offered by Christie’s is a 1650 engraving by Wenceslaus Hollar of a painting of this composition. Although the engraving doesn’t look much like the Christie’s painting, and closer resembles a Luini now in the Chiesa di San Bernadino in Naples, it is confidently presented as being a depiction of the painting. Of course Hollar says the painting he engraved is by Leonardo but at this date anything Milanese, and of Leonardo’s school (he has at least 15 pupils over his two Milanese periods), was given to the master himself. Hollar had fought for the Royalists and been captured at the siege of Basing House in 1645. He escaped and by 1646 was working in Antwerp where it known he met up with his old client, the Duke of Arundel. He stayed in Antwerp not returning to England until 1652. His engraving of the ‘Salavator Mundi’ was executed in 1650 so he cannot have had the painting in the Royal Collection in front of him. Christie’s get round this by suggesting he had made a drawing of the painting earlier (which is possible) and did his engraving of the painting from the drawing. More likely he had another completely different picture in front of him (like the Luini in the Chiesa di San Bernadino) that would explain why the engraving does not look much like the Christie’s painting. The King’s picture worked its way through the Commonwealth sales with Christie’s saying, “An inventory records that the painting was sold at the ‘Commonwealth Sale’ on 23 October 1651 to John Stone, a mason (in modern terms an architect or builder) who was representative of a group of creditors who received it and other paintings in repayment of debts. Nine years later, when Charles II was restored to the throne and his late father’s possessions were recalled by an act of Parliament, Stone returned the painting to the Crown. A 1666 inventory of the collection of King Charles II at Whitehall lists it among the select paintings in the King’s closet, as item 311: “Leonard de Vince O.r. Savio.r w.th. a gloabe in one hand and holding up y.e other.” The picture very probably remained at Whitehall in the reign of Charles II’s successor, James II, passing to his mistress, Catherine Sedley, Countess of Dorchester (1657-1717), and by descent until the late 18th century.” Apparently the colorful but plain Catherine was bewildered when chosen by James to be his mistress saying, “It cannot be my beauty for he must see I have none,” …. “And it cannot be my wit, for he has not enough to know that I have any.” It seems unlikely that James would have given his mistress a painting from the Royal Collection that was considered to be a real Leonardo. 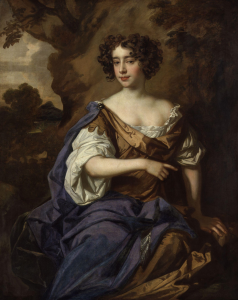 Catherine Sedley, later Countess of Dorchester, Mistress of James II and Restoration wit and libertine, by Sir Peter Lely in 1675. There is no reason why Christie’s Contemporary art department should understand the weaknesses in any of this. The Old Master Paintings Department would have which is probably why they did not handle the sale. It is all a stretch. All that can be said for sure is that the King had a painting of this composition, which was most likely to have been by one of Leonardo’s followers, and this painting worked its way through the disposal of the King’s collection and re-entered the Royal Collection when Charles II was restored. It somehow descended down to Catherine Sedley before it disappeared. It may or may not be the Christie’s painting. And Hollar engraved a version of this painting which may or may not be the Christie’s painting. While the painting was in any of these collections no one ever considered it of any value or interest or discussed or mentioned it in which would be in keeping for a Leonardo school painting. The Christie’s painting appears or reappears (if it is indeed the painting formerly in the Kings Collection) in 1900 when it was acquired by the collector Sir Francis Cook who displayed it at Doughty House, Richmond. Cook, born in 1817, died in 1901. From here we can be more sure of the provenance….. but not of who actually painted the picture. The businessman and collector, Sir Francis Cook, taken from the 1913 Catalogue of his famous collection. 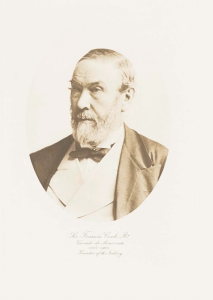 Cook, one of the three richest men in England, and a great collector, was the Chairman of Cook, Son and Co, a leading trader of wool, cotton, silk and linen at that time. An image of the Christie’s painting believed to be taken at the time it was in the Cook Collection circa 1913. A late addition to the Cook Collection the catalogue states it was purchased in 1900 for pounds 120 from Sir J.C. Robinson (1824 – 1913), the collector, scholar and curator who built up the collection of the South Kensington Museum which later became the Victoria and Albert Museum. 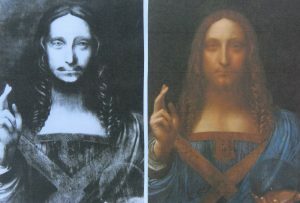 Robinson sold it to Cook as a work by Bernadino Luini but Tancred Bornius reattributed it stating, “This picture, which has suffered both by over cleaning and repainting, appears to be a free copy after the Salvator Mundi by Boltraffio in the collection of the late Signor G.B. Vittedini at Arcore, near Monza.” Herbert Cook, the grandson of Sir Francis Cook, adds in a postscript in the catalogue, “I should prefer to say a parallel work by some contemporary painter of Leonardo’s school.” Both Tancred Boronius and Sir J.C. Robinson were specialists in Italian Renaissance painting at a time when the subject was much better known than it is today and it clearly did not cross either of their minds that this painting was by Leonardo. Christie’s continue by saying Cook’s descendants sold it at an auction in 1958 for around pounds 45. 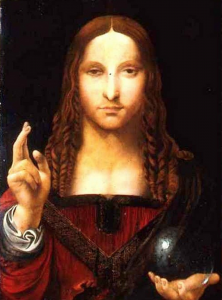 In 2oo5 it was bought by a consortium of US-based dealers reputedly including Alexander Parish, Robert Simon and Warren Adelson, supposedly for under US$10,000 at an estate sale in Louisiana, and they, having cleverly authenticated it to Leonardo, sold it via Sotheby’s to Yves Bouvier in 2013 for approximately US$80m who in turn sold it on to Dmitri Rybolovlev for a reported US$127m. By the time the painting was bought by the US dealers the condition, already described by Boronius in 1913 as bad, had worsened. The walnut panel had split and was patched together with stucco and glue. ARTnews reported, “it was a wreck, dark and gloomy.” The dealers gave it to the New York based restorer Dianne Modestini who removed the overpaint and skillfully restored the painting back into Leonardo using the Hollar engraving and the Windsor preparatory drawings as a template. Modestini took 6 years to Leonardo the painting into its current state of Leonardesque. And it is here that, perhaps allied to the amount of money that was being made and available for distribution, that reality seems to have evaporated and virtually everybody that came into the paintings orbit suspended their ability to look and started talking as if they were standing in front of the Mona Lisa herself. 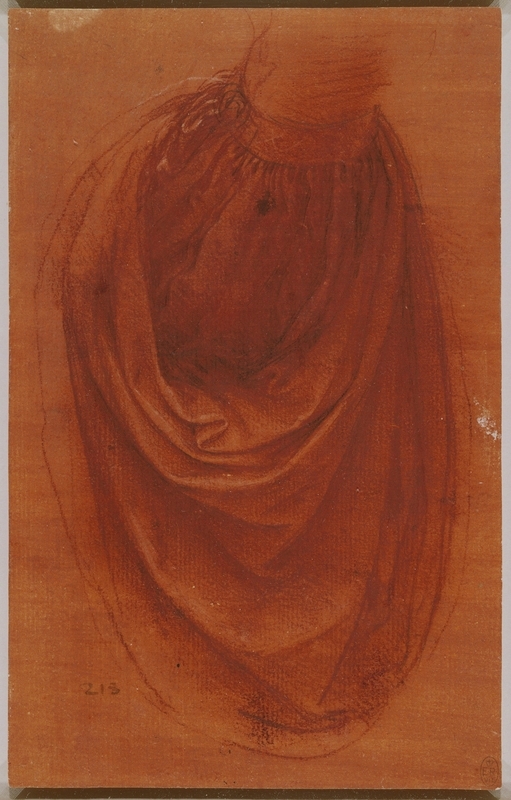 There are two drapery studies by Leonardo in the Royal Collection that are currently considered autograph that relate loosely to the composition of this painting. Pounds 45 in 1958 to US$450m in 2017 is a crazy ride, perhaps the craziest in art world history. The painting is at the centre of the enormous and ongoing legal battle between Bouvier and Rybolovlev….although perhaps Rybolovlev will now feel less aggrieved about Bouvier’s alleged US$1bn commission (made during Bouvier’s selling 38 paintings to Rybolovlev for US$2bn). It may even affect the lawsuit as it becomes harder for Rybolovlev to argue Bouvier was overcharging him. When he sells other valuable paintings in the collection such as the 4 Modigliani nudes he will surely come out ahead. Whoever bought this painting has chosen to ignore, or more likely isn’t aware of the painting’s attribution, legal, condition and ownership problems. Or maybe they don’t care and are going to put the painting in a museum as a draw and believe the paintings controversy will only add to its appeal. Who has got this kind of money and would want a picture like this? Most Western buyers recoil from the paintings condition, questionable attribution and the fact that most of what you see is by a restorer. That leads to someone who has heard of Leonardo, is drawn to his mystique, and probably comes from another artistic tradition such as a Chinese or Arab client who can buy into the myth as opposed to the painting. There was also at least one Russian bidder. 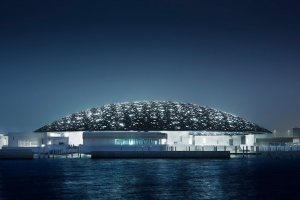 My guess is somewhere like the Louvre Abu Dhabi where it could provide the centrepiece of the newly opened museum in Saadiyat island. 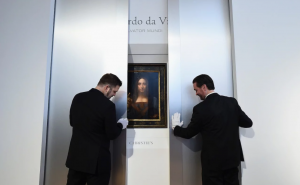 They currently have Leonardo’s ‘La belle Ferroniere’ on loan from the Louvre for a year, the first time a Leonardo has been seen in the Middle East. That will have familiarised them with the artist and seen what a draw he is. No doubt we will find out soon enough. Of course the sale will probably generate another lawsuit in due course. The painting is already at the centre of the largest lawsuit in art world memory. The pictures recent history definitely warrants a movie and maybe that was running through Leonardo di Caprio’s mind as he admired the painting. Christie’s small print says they guarantee their attributions for 5 years only. A lawsuit within 5 years could be bit awkward but the massive commissions generated, (reportedly circa US$50m alone to Christie’s), should cover the legal fees and after 5 years it doesn’t matter anyway. Best of luck to the buyer but I see trouble ahead for them as this attribution will most likely not stand the test of time. I offer my congratulations to the dealers involved, the auction houses who sold the painting, whoever underwrote the U$100m guarantee, and most of all to Christie’s contemporary art department, who have proved that emotion, hype, marketing and the model they have developed for new buyers and artists such as Basquiat and Warhol is transferable to other markets such as Old Masters. We shall be seeing more of this in the future. On paper this was an impossible deal, akin to alchemy, wizardry and fairy dust, and although I don’t personally like the painting, I take my hat off to the chutzpah of those who managed to pull it off. “Salvador Mundi” might not be a Leonardo’s masterpiece, but this masterful analysis could be considered as such.